Prospect Hill Academy leads its students on an academically rigorous, culturally rich, and socially and emotionally engaging journey from kindergarten to college. Prospect Hill Academy (PHA) is one of the oldest and largest Massachusetts charter schools located in Somerville and Cambridge and serves nearly 1,200 students in grades K to 12 from diverse racial, ethnic, and socio-economic backgrounds: 55% are black, 21% are Hispanic, 13% are white, 8% are Asian, and 3% are of mixed or other races. 63% are low-income, and 47% come from homes where English is not the primary language spoken. 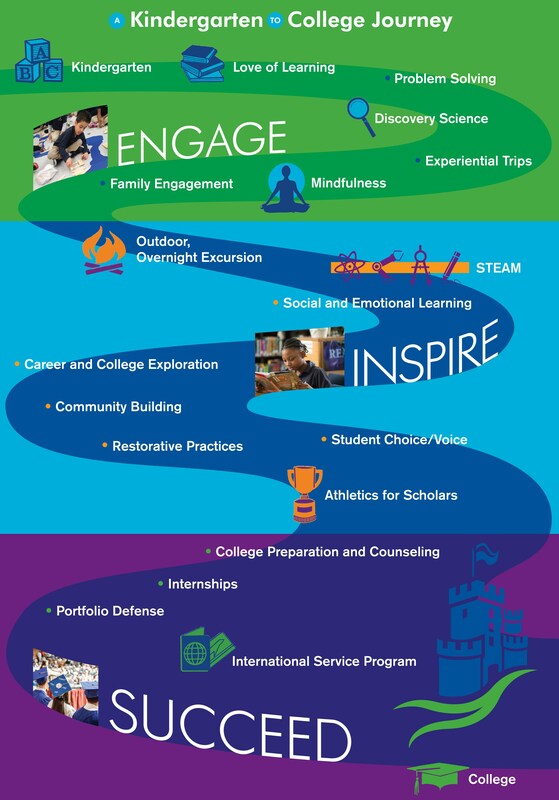 PHA is unapologetically a college preparatory school and focuses on teaching students the academic knowledge and skills and the social and emotional competencies required to succeed in college and beyond. That means, in addition to engaging our students in a rigorous, culturally relevant, and differentiated curriculum, we ensure they develop effective college-going habits and participate in a strong and caring school community based on Restorative Justice practices. Over 95% of PHA graduates matriculate to college (most being the first in their families to do so); PHA has consistently placed in the top 4% of all U.S. high schools per U.S. News & World Report; and Boston Magazine placed PHA among the top ten charter schools in Massachusetts.